My neighborhood is boring. I live in a suburb of a major east coast city. We have an excellent school system, low crime, residential streets with nicely manicured lawns, and it’s boring. Our homeowner’s association requires certain standards to keep the appearances uniform — and it’s boring. I didn’t know the area when we moved here, didn’t realize I would feel frustrated and out of place, but we are stuck here until my husband finds a job in a state about seven hours south of here, where we want to live. But I am a writer, and I live for creativity and imagination. I have always been very good at pretending. I make it a priority to look for the unusual when I am out. Today when I was out walking I found tiger lilies in bloom, which reminded me of rural southern Illinois where I grew up. We often found tiger lilies in bloom along the roadside where an old farmhouse had once stood. 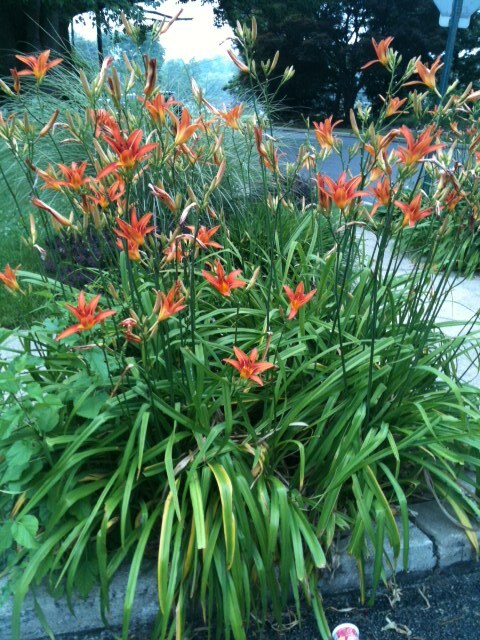 The house was long gone, but the tiger lilies came up year after year in a riot of orange color. I may write a story about tiger lilies. Anyone can bring creativity and color into their life with a little effort and awareness. I have a friend who is an artist at baking cookies, and makes them for any occasion with her own special touch. Another friend is a librarian and brings her sense of humor and imagination to her job. A third friend was forced to quit her government job for health reasons, and has just created a web site for the new business she is launching. One of my favorite quotes is from the movie Dead Poets Society with Robin Williams. He tells he students, “Make your lives extraordinary.” I challenge other writers, readers and myself to do just that. Don’t settle for a boring neighborhood.